In loving memory of Spokes Committee Member, Doctor Gill Corble who died on Friday 29 September at the Pilgrims Hospice in Canterbury. ​Gill’s enthusiasm for life and cycling, in particular, was infectious. Always the most outspoken and dynamic member of the committee, she galvanised everyone into action. ​Our deepest condolences go to her husband Frank Guthrie and the family. ​She will be very sadly missed. 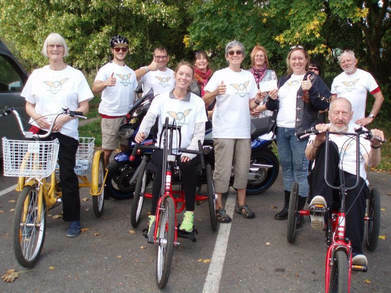 A SPOKES-sponsored project, Wheel Potential helps adults with various disabilities get out on a specially-adapted bikes. ​Recently they were runners up in the Kudos Awards organised by Kent Sport. A film made for the Awards shows the valuable work done by Wheel Potential - http://www.wheelpotential.com/wordpress It was summed up by one participant - freedom, fresh air and enjoyment! They also received a £200 cheque from Suzie Marshall and members of English Rose Sisterhood, an lively group of female motorcyclists in October. Suzie’s father, Bill, (on the right of photo) who sadly has lost his balance due to Parkinson’s, was a racing cyclist in his youth and now benefits from the club outings. Does anyone have a cargo bike to take children to school? In case you’re wondering, the SPOKES AGM will take place in March next year. The speaker and date will be confirmed in the next month. The next edition of Mudguard is due out in February 2018. Please submit your ideas, articles, adverts, etc. no later than mid January, 2018. Many thanks. 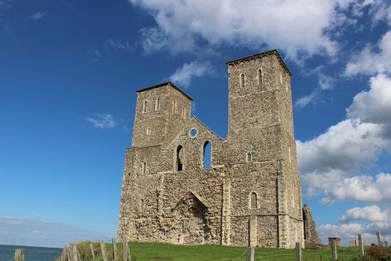 Meet at 10.30am Whitstable Station, south (inland) side for about a 25 mile ride along the coast, mainly traffic free to Herne Bay, Reculver Towers and back with a short detour into the countryside on quiet roads. Pub/café lunch. Ride leader: Ian Rogers on 01227 749598. On 3 December the Spokes ride starts from Canterbury West and will be out towards Wickhambreaux and Preston, about 20 miles. Ride leader: Beatrice Shire. In 2018 the 7 January ride will be around the Ham and Luddenham Marshes starting from Faversham station. Any twitchers should bring their binoculars! Ride leader: Andrew Wyvers. Good news - the final road works needed to finish phase 1 of the Folkestone to Greatstone Coastal Route will start on 30 October. This is some 6 months after the original completion date but a sign of real progress. The work involves a pedestrian crossing on A259 at Sandgate Esplanade, resurfacing and realigning the central white line on the road. This will move cars currently parking on the shared pavement/cycle lane, onto the road. The NCN 2 at Lydden Spout on the Folkestone to Dover off- road section has an area where illegal motorcycling has destroyed the path. It is hoped that the National Trust will soon purchase the land. Spokes is keeping a record of the motorcyclists, including the registration numbers of their vehicles, which are usually parked on NCN2 approaching Abbott’s Cliff. Will anyone passing on this route, please email paulrrees@btinternet.com with dates and times etc. when motorcyclists are seen on this land, which is the old rifle range or on NCN2 bridleway? Wood from old whisky casks have been used for the first time to make a bicycle. Each frame uses about 15 staves from whisky casks from the Glenmorangie's distillery in Tain, Easter Ross. The casks are shipped from Scotland to the US and then taken to bike builder Renovo's workshop in Portland, Oregon. 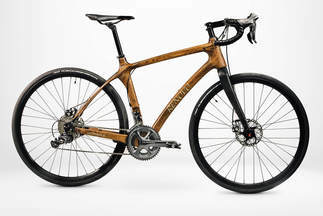 Renovo specialises in sustainability and has made more than 1,000 bikes with wooden frames since it started in 2007. The Glenmorangie Original is a rolling testament to the versatility of wood. Described as a world first by the distiller and the bike makers, it costs over £5,000 to buy. 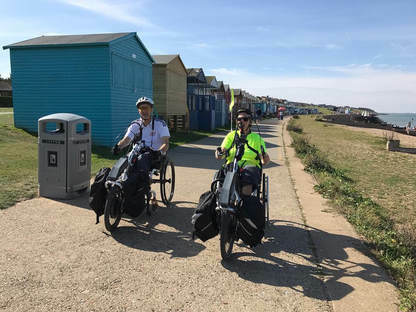 In September members of East Kent Handbiking Club rode from Canterbury to Herne Bay via Whitstable. ​The new accessible gate at South Street in Whitstable made this possible for the first time.